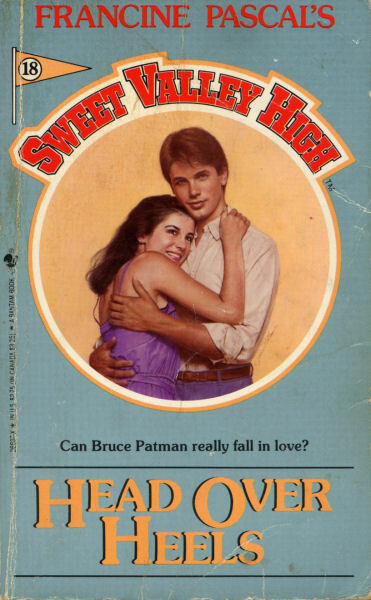 Regina Morrow is totally in love with Bruce Patman, and vice-versa. 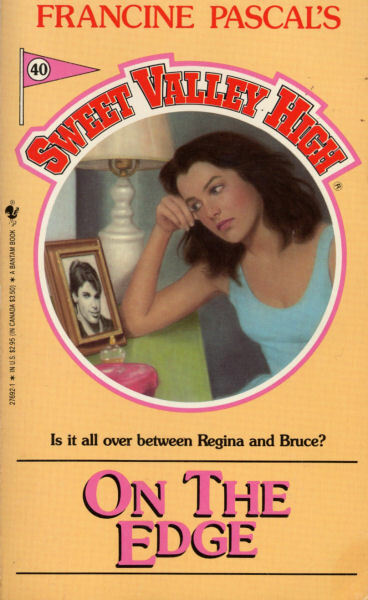 Everyone at Sweet Valley High is mystified by Bruce’s sudden transformation from douche truck to doting boyfriend, but he seems pretty sincere. This sincerety bothers Jessica, still bitter from her own failed relationship with Bruce. 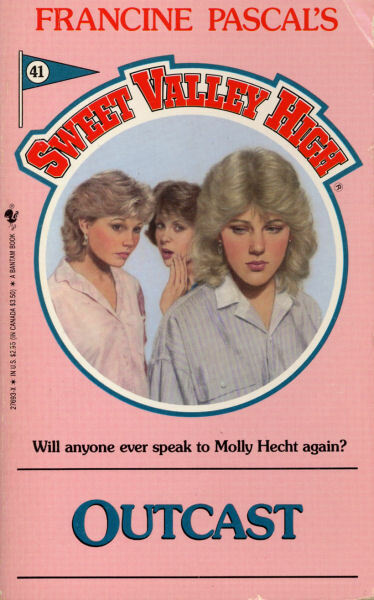 She bets Lila that the relationship will be over before the charity carnival being held at Sweet Valley High in two weeks. The terms of the bet stipulate that the loser has to write the winner’s 15-page term paper. This will end well. When Regina’s parents tell her that she’s a candidate for a new treatment to restore her hearing, Regina is overjoyed until she finds out that the treatments will take a year and require her to relocate to Switzerland. Regina can’t stand the idea of leaving Bruce for an entire year, and she refuses to listen to reason, even when her parents bring in a boy named Donald Essex, a former deaf kid who can hear thanks to the treatments. Meanwhile, Jessica is starting to worry about the bet. She decides to speed up the inevitable breakup by telling Regina that she heard a rumor Bruce only started dating her to gain popularity for his run as president of student council for the Sweet Valley Centennial Committee. When Regina questions Bruce about why he didn’t tell her he’s running, he’s evasive, and Regina freaks out and breaks up with him on the spot, deciding to go ahead with the move to Switzerland. Bruce is miserable and asks Liz if she knows why Regina would break up with him all of a sudden, and Liz spills the beans about the entire situation. Bruce doesn’t want her to go to Switzerland but knows it’s important, so he writes her a letter professing his love and asks Liz to sneak it into Regina’s bag so she won’t see it before she leaves and change her mind. Regina finds it on the plane and cries and feels hopeful. 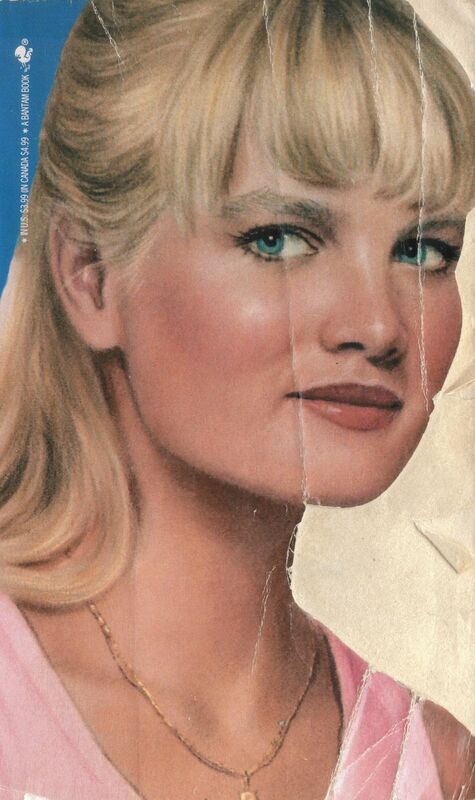 The B-Plot involves the planning for the charity carnival being held at Sweet Valley High. The carnival’s aim is to raise money for the handicapped children’s ward of Joshua Fowler Memorial Hospital. Liz is in charge of the planning, and it’s pretty stressful. The carnival comes together at the last minute, complete with a master of ceremony, an exotic food stand, and an inspirational speech by Skye Morrow, Regina’s mother. They raise $800 for the hospital, and all is well in Sweet Valley yet again. Both Bruce and Regina seem to favor outfits that include blue and white: Bruce wears a navy blue blazer with chino pants and a navy and red-striped tie, while Regina dons a navy-blue cotton dress with tiny white flowers and white cotton jeans with a striped t-shirt. 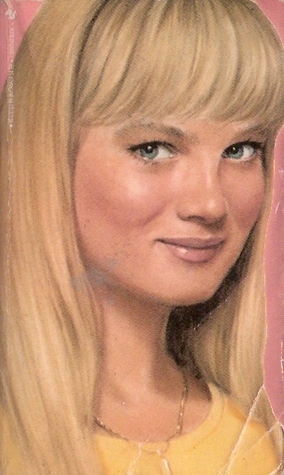 It seems that both the Morrow family and the Fowler family’s fortunes are in computers, which leads this reader to wonder: Is Sweet Valley the new Silicone Valley? Trying to snark on the fact that there’s a cure for deafness makes my brain want to explode, so we’re going to move right past it. However, it is worth mentioning how many times the word “handicapped” is thrown around in the novel. The book was originally published in April of 1985, when a term like “handicapped” was still used. It is interesting to note that even in the past few years, that term has been deemed archaic and politically incorrect. Every time Regina’s “handicap” was mentioned or the teens talked sympathetically about the “handicapped children” at the hospital, I cringed a little bit. It’s amazing how powerful words can be. Finally, a tiny nitpick with Regina’s sendoff. She takes off for Switzerland without either parent. She is sixteen, deaf (for the foreseeable future), and heading to a foreign country to live without the support of a parent? Mr. and Mrs. Morrow couldn’t scrape together the money for an extra plane ticket to accompany Regina and at least help her get settled? I’m not buying it, folks.